A world conference on development aid for Afghanistan has opened in Berlin with a call to end the impoverished post-war state's "spiral of violence". 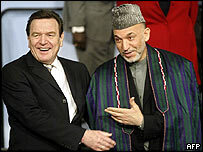 German Chancellor Gerhard Schroeder, the host, urged the world to "stress its commitment to a secure, free and democratic Afghanistan". Kabul is seeking $27.5bn over seven years during the two-day meeting of officials from more than 50 nations. But its officials privately admit they will be lucky to get even half that. "This conference is a unique opportunity... for the international community to send the Afghan people an unequivocal reassurance that it will remain by their side," UN special envoy Lakhdar Brahimi told the meeting. The UN has warned Afghanistan is in danger of becoming entirely dependent on the illegal drugs trade and reverting to chaos unless it receives sufficient foreign aid. The BBC's Crispin Thorold reports that Kabul's argument for aid is a simple one: spend the money needed to help the country stand on its own feet now or else pay the price for a failed state later. The conference is taking place in a Berlin hotel with security provided by some 1,300 police officers. The Berlin conference follows a first donor conference held in Japan in 2002 and will consider a report submitted by the Afghan government and institutions like the World Bank. The World Bank's country director for Afghanistan, Alastair McKechnie, has defended the size of the aid being sought, putting the total cost of two decades of war at about $240bn. "The figure of $27.5bn may seem a lot but it will simply help Afghanistan get back on the track from which its people were brutally wrenched in the late seventies," he said. Afghan leaders hope that one of their most convincing arguments in Berlin will be a simple comparison between their petition for $27.5bn and the annual Afghan security bill of more than $13bn which the international community has to foot, our correspondent reports. Afghan Finance Minister Ashraf Ghani said that new investment would nurture the hope of peace whilst international neglect would spell "dire consequences" for both Afghanistan and the region. President Hamid Karzai told the conference that his country's achievements to date had been "very promising" but reconstruction had "only begun". The government, he said earlier after talks with Mr Schroeder, wanted to create an Afghanistan "no longer a burden on the shoulders of the world... an Afghanistan that will be able to pay for itself". That vision seems a long way off, our correspondent notes. The Taleban has regained footholds in many southern areas of the country. There have also been serious outbreaks of factional fighting in other parts of the country, with the central government controlling only the capital. The Afghan government has been forced to delay presidential and parliamentary elections scheduled for June until September because of security concerns and problems with voter registration. On Wednesday, the Pentagon confirmed that the first of 2,000 US marines had arrived in Afghanistan amid ongoing operations to crush the Taleban and its ally al-Qaeda. "The trade in illegal drugs is booming"